Multi-Wheel Roulette is the latest craze to hit the online casinos. If you thought one wheel was boring you now have the chance to play up to 8 wheels in one go. 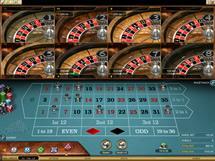 The Multi-Wheel Roulette game is a brand new game that has been introduced at a number of casinos including Royal Vegas. Based on the original European Roulette game with a single zero wheel i.e. 37 pockets you can play Roulette in the same way as you always have just with the extra wheels. The new Multi- Wheel Roulette game can be played with up to 8 wheels and you can choose to play all eight wheels or however many you want, depending on what your budget is and how you take to the game. By clicking on one of the wheels in the picture, it is taken off the screen and not part of the game. The way that this game works is that you place bets in the normal manner, as if you are placing one a single wheel and the best are multiplied by the number of wheels that you are keeping in the game. For example if you place a normal street bet and a bet on all odd numbers, and you have kept all eight wheels in the game, then you are in fact placing a bet on eight wheels. In other words you receive an extra seven chances to win with each spin of the wheels. But, it must be remembered that with every extra wheel that is in the game you also place the same amount in a bet, which means you have to accommodate the extra bets with your bankroll. Since bets can range from $1 up to $50 per chip, you really are given plenty of chances to balance your bets and your bankroll and decide on the best way to place your bets and on how many wheels. One of the other great features of the Multi-Wheel Roulette game is that you can choose the Auto-play feature. Auto play allows you to set the game to play by itself based on the bets that you have placed. The game can run for as long as you want, leaving you free to do other things. This auto play feature is a great asset for many players who love the game of Roulette but just don’t have the time to spend on watching the wheels spin. On the other hand, it is such an exciting game with so many possibilities and chances to win, eight times over, that you might want to watch the ball come to land in the spinning wheels. This Multi-Wheel Roulette game is a great addition to any casino and is destined to have a long and exciting future ahead of it, with the multi betting possibilities it offers and multi chances to win. Multi Wheel Roulette can be played for fun or practice as well as play Multi Wheel Roulette for real moneybut of course the real money bets and games bring you the most satisfaction and winning chances.